Our first visit to Portugal was with a caravan in 1994, not to the popular Algarve but to the north of the country, the Costa da Luz. We spent two weeks at Camping Vagueira which is close to the town of Aveiro and about 40miles south of Oporto. Our next visit was 7 years later in 2001 in our motorhome when the lure of the Algarve and southern Spain proved too much to resist. We enjoyed this grand tour so much that we did not take much persuading to return with friends the following year in 2002, when we revisited the Costa da Luz where we had found the people so hospitable on our first visit in 1994. This hospitality was to be repeated and their kindness and honesty during both our visits was much appreciated. Leaving the north we then worked our way down the coast to the Algarve and into southern Spain. In 2009 we travelled south to north whilst on route to north western Spain. This is our account and views of the Portugese sections of our trips. For more information on Portugal click on Portugal - Tourism and if you want to go direct to a section of this account, click on the highlighted text. To read our notes on the other countries we have visited, use the left hand side menu. In 1994 we crossed the channel from Newhaven to Dieppe using the Seacat and took 4 days to travel the 1090 miles to northern Portugal. The route was via Rouen and down the west of France, crossing the border into Spain at Irun. We then climbed the Pyrenees from San Sebastian onto the Spanish Plateau using the N1 to Vitoria and then across Spain using the N620 via way of Burgos, Valladolid and Salamanca. We crossed the border into Portugal at Villa Formosa, descending from the Spanish plateau down to Aveiro which is about 40 miles south of Porto. We remained here for nearly 2 weeks during which time, in addition to visiting the Aveiro local area, we made day trips to Oporto, Coimbra, Bucaco, and Nazare. In the Spring of 2001 we used the Portsmouth to Bilbao ferry and then the A68 and A1 to travel to Burgos to join the route used in 1994 to Valladolid and Salamanca. From Salamanca we took the N630 south to Badajoz then the N4/N18 across the border into Portugal to Evora where we stopped for a couple of nights before taking some rough but interesting country roads south to join the IP1 for the Algarve where we spent three weeks sightseeing. Our first stop there was at Luz just west of Lagos. We then ambled along the N125 Algarve coast road stopping at Quateira, Olhao, Fuzeta and Monte Gordo before crossing into Spain. Our route in 2002 was similar to that of 1994 but we crossed the channel via Dover to Calais and took the A28 to Rouen to join our 1994 route. This time we took 6 days over the journey, stopping for two nights to visit Salamanca in Spain before entering Portugal. After crossing into Portugal our first stop was Guarda and then on to Madalena just south of Oporto. 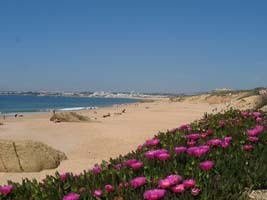 The area to the south of Oporto, the Costa da Luz, is much cooler than the Spanish Mediterranean coast or the Algarve. While it is pleasant sunbathing on the vast expanse of beach available, the sea is very cold. After six days of glorious weather we moved on to re-visit Aveiro and Nazare and then travelled further south to Guincho and a site to the west of Lisbon before worsening weather persuaded us to drive on down to the Algarve. In 2009 we passed through, south to north in transit from southern to north western Spain but did take the opportunity to re-visit Quateira and Coimbra. However, we did not manage any sightseeing at the latter. We also visited the medieval fortress town of Obidos and the northern coastal area on the border with north western Spain. A blog of the this trip can be read here. Even in 1994 we found the roads from Dieppe all the way to Aveiro very good although travelling through Rouen could be a little difficult but, with the advent of satellite navigation and road improvements, this should no longer be the case. Our preferred route to the south is via Dover to Calais. This route offers a wide choice of carriers and prices for the crossing and although it gives a longer drive than going via Bilbao, it can be treated as part of the holiday. It can also be cheaper bearing in mind that on long sea crossings the fare does not cover your total costs. You still have meals to pay for and have to keep yourself entertained. Extras can add as much as £100 to your fare cost. However if you do chose the longer crossing, Salamanca is an easy days, drive on fast roads, from Bilbao on the A68 and A1 toll roads. Salamanca is also a worth while stop over. In winter time and even in early spring there can be snow in the Pyrenees. In this event, the A68 is the better route being a more gentler climb than the N1 from San Sebastian. It is reportedly also kept clear of snow. In 2002 the N1 was being upgraded, it was not bad in 1994, just a little steep and twisty in places and if you got stuck behind a heavy lorry, it made the ascent tedious. Considerable work has been done on the Portuguese roads over the years and there should be no problems on major routes but be warned some of the country roads were dreadful and minor roads in urban areas can be very narrow and unsuitable for motorhomes. Portuguese motorways are not toll free. They used to be operate in much the same way as the French autoroutes but in 2010 electronic toll systems began to be introduced. Campsite standards are generally lower than elsewhere on the continent. The Orbitur Club runs a chain of sites in Portugal which are generally of a higher standard than most. For futher information click here or have a look at our notes on the sites we visited by using the top left hand side menu on this page. At the time of our first visit in 1994, northern Portugal could not be classed as wheelchair friendly, by this I mean there is an absence of facilities especially designed for wheelchair users, notably toilets for the disabled. Days out in 1994 were difficult, but we did find toilets at a motorway service area on our way to the picturesque coastal resort of Nazare. We noticed improvements during our visit in 2002 but access in Portugal remains difficult for the wheelchair visitor mainly due to the cobbled streets and the lack of dropped kerbs. The Algarve is a little better but there is still a lack of disabled facilities although most of the esplanades at the resort towns, are level and wheelchair friendly. Of all the places we visited, we rated Quarteira the most wheelchair friendly although it lacked character. Guarda, (last visited March 2002) Located high in the Serra da Estrela, we made an early night stop here to allow time to look around. This small town is not a very wheelchair friendly place to visit. It is located on a hill top and its old centre has some of the roughest cobbled streets seen in Portugal. Oporto (last visited March 2002) A day out to and a visit to the port wineries on the banks of the Douro is a must, but it is not easy for a wheelchair user. On the two visits we have made, we drove there and in 1994 visited the Sandeman bodega (cellar) and afterwards took a sunset boat cruise up the Douro. In 2002 we visited Grahams bodega. Sandeman's is on the riverside and is probably the easiest to visit for the wheelchair user. Grahams on the other hand, is on a steep hill but once in the visitors center, tour access is level. Parking to visit any of the bodegas is not easy and there are no areas dedicated to the disabled. 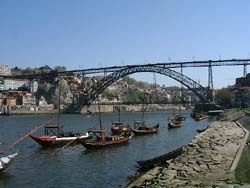 In 2002, while in the Porto area, we re-visited places last seen in 1994 and did not notice much change. However, substantial building works are in hand in the vicinity of Vila Nova de Gaia and an indication of things to come can be seen at the new commercial centre at Arrabida which is wheelchair friendly and has wheelchair accessible toilets. 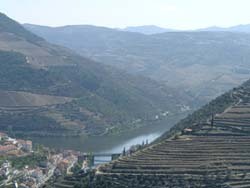 We did not take a river trip in 2002 but used the motorhome for a day trip to the upper Douro. I was advised not to drive the lower reaches so took the A4 auto route and N15 to Villa Real, briefly visiting Amarante on route. From Villa Real we then took the N322 to Mateus and Pinhao where we again stopped briefly. We then drove down the Douro valley to Peso da Regua and then north up the very twisty N2 back to the N15 and the A4 to return to Porto. It was a long day and slow going once off the A4 and N15 but this scenic route is quite feasible with a large motorhome and the views descending into Pinhao were terrific. If I did it again I would take more time and night stop somewhere. 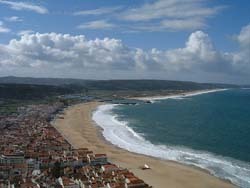 Espinho, (last visited March 2002) A fairly large town south of Porto which on appointed days hosts a large market. The area is mostly flat, there are no dropped kerbs but it is not too difficult to get around. The sea front esplanade is especially wheelchair friendly. Coimbra (last visited June 2009) It is now easier to visit Coimbra than our first visit in August 1994 because a campsite has since been establised on the outskirts of the town about 4Km from the centre. A bus route to the centre passes close by this site but we doubted this was wheelchair friendly. Our visit on this occasion was spoilt by the weather and our failure to find a parking spot for the motorhome closer to the centre and we abandoned any attempts at sightseeing. However, we did noticed the town was much larger and busier than we remembered but beyond that we cannot provide an update on our fascinating and worthwhile visit in 1994 which at that time was a struggle. There were then no toilet facilities and we had to manage with unmodified ones provided in cafes. On one occasion, a wheel was removed from the chair in order to get through a toilet entrance. Coimbra is on a hillside and it was a steep push up to the old university buildings but was well worth the effort for the views. Bucaco National Park, (last visited August 1994) This is famed for the battle in 1810 when Wellington defeated the French. Looking out over the countryside from where Wellington stood to command the battle, you cannot help but feel awe inspired and can fully appreciate why he retreated to these hills to make a stand. A small well kept and interesting museum features the battle. Aveiro, (last visited April 2002) An interesting town well worth spending some time visiting. It has undergone considerable modernisation since our first visit in 1994 without loosing any of its character. It is now easier to get around with a wheelchair and a new wheelchair friendly shopping precinct has been built. The canal side now looks much more neat and tidy and the shopping precinct forms part of a walkway along its sides. We rashly tried a boat trip out onto the Ria, not very interesting and the falling tide made it a nightmare getting the wheelchair ashore at the end of the trip. Our view, not recommended! Averio has many fine buildings one being the railway station. While there, an intercity train from Lisbon pulled in on its way to Porto. What a train! Very smart and tidy and from its sides out popped the steps for passengers to alight and board. It also had a wheelchair accessible carriage with a wide door and it appeared ramps were available in much the same way as the steps had appeared! However, local commuter trains are a different matter! Close by Aveiro is the picturesque village of Costa Nova with its pretty painted houses. Again modernisation has arrived without really affecting its charm. The little indoor market still thrives and seafood restaurants abound. A tourist bureau and wheelchair accessible toilet have been added, both were not open, we presumed it being too early in the year. The area is level but unfortunately there are still no dropped kerbs. Nazare, (last visited April 2002). A picturesque coastal resort with an excellent beach overlooked at its northern end by cliffs from which there is a very good view of the town. The promenade is level and there is good access to the beach but inland the town slopes steeply up the surrounding hills. The cliff tops can be reached by road and the view points although cobbled are wheelchair accessible. A rack and pinion railway also accesses the cliff tops from the beach but it is not suitable for the wheelchair user and as in 1994 we found no facilities for the disabled in the town. Close to Nazare is the town of Alcobaca, (last visited April 2002). Its main attraction is the Monastery which it was not possible to visit due to the flight of steps leading up to the entrance. The town centre lacks the cobbled streets so often found elsewhere in Portugal so getting about was a little easier. Obidos, (last visited June 2009) Located north of Lisbon near the coast this walled fortress medieval town is a world heritage site and is well worth a visit although access for a wheelchair user is limited. The narrow streets are sloping and cobbled and a power chair is recommended. Entrance to the walled old town is gained through an impressive gateway which is embellished with tiled murals and leads directly to the main street. This is lined with touristy shops and leads to the main square and a castle built by the Moors. White washed houses adorned with bougainvilleas, honeysuckle and fuchsia make the town a delight to wander. Guincho, (last visited April 2002)Located to the west of Lisbon close to Cascais, we spent 3 days here. Unfortunately the weather was not very kind to us which restricted our touring. However, we did manage one day out to Sintra and Cabo da Rocha, the most westerly point on the continent of Europe. Parking at Cabo da Rocha is easy and access to the view points and shop is via tarmac pathways. There is a cafe below the shop but access to it for a wheelchair user is via a steep ramp which is dangerously slippery in the wet. We found Sintra a little disappointing perhaps because of the weather? Getting around was easier than we thought although there are areas of wheelchair inaccessibility. We did not go into the palace and the disabled toilet on the railway station is nothing more than an ordinary cubicle which is inaccessible to the wheelchair user, so don't waste 25 cents. Our impression of the whole area around Guincho was one of a more modern Portugal and more convenient for the wheelchair user. A visit to the commercial centre near the Estoril motor racing circuit will quickly confirm this but, don't go in a motorhome as the parking height is restricted to 2 meters. Here you will find a modern wheelchair friendly shopping centre with disabled parking, lifts and wheelchair accessible toilets. Evora, (last visited March 2001) is a medieval town and as such you would not expect it to be wheelchair friendly. This is indeed the case. The roads within the walled town are narrow, steep and cobbled. There are no dropped kerbs and we found access to the historic buildings impossible. This said, there is disabled parking in the town and the spot by the cathedral is probably the best for the determined wheelchair visitor. We stayed two nights at Camping Evora which is within walking distance of the old town. Apart from parking spaces, the only other disabled facilities we found were those on the camp site. 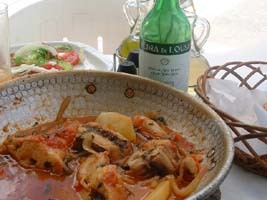 Algarve, In 2001 we stayed at Luz near Lagos, Quarteira, Olhau, Fuzeta and Monte Gordo before crossing into Spain. Our program in 2002 was similar but we stayed at Luz, Armacao de Pera and Fuzeta. The main attractions of the Algarve are undoubtedly the excellent beaches, golf, and of course the sunshine. Lagos and Luz(last visited April 2002) - No disabled facilities discovered at either place. Lagos is not easy to get about without assistance once off the esplanade due to the cobbled areas and lack of dropped kerbs. Luz is a smaller coastal town 5Km west of Lagos. The difficulties are similar to Lagos but the area is more hilly. Whilst in this area we visited Cabo St Vincient without difficulty and the fort at Sagres. En route to St Vincient there is parking available on the cliff tops with fine views. Access to the grounds of the lighthouse at St Vincient is not difficult and there is no charge for the wheelchair disabled to enter the fort at Sagres where there are good wheelchair accessible toilets in the fort grounds but expect rough paths. Quarteira(last visited June 2009) -Our first visit was in April 2002. Whilst we rated this the most wheelchair friendly place we visited in Portugal you will still find dropped kerbs leading onto a zebra crossing but not off it or a step up into a disabled toilet! Quarteria has a long level esplanade with access to the beach and its cafes. There are some ramped areas and dropped kerbs though these can be very steep. Good toilets for the wheelchair disabled indicate the efforts made to cater for wheelchair users but the toilets at the eastern end of the esplanade had a single step up at the entrance! Those opposite the Dom Jose hotel were fully accessible. Whilst staying here in 2002, we hired a car and visited Albufeira, Monchique, Praia de Gale and Ponta do Castelo. The town had grown and we found it much busier in 2009. Camping Orbitur Quarteria is within walking distance of all facilities and the pitches were much improved since 2002. but sadly this handy site is scheduled to close at the end of the 2010 season. Albufeira(last visited April 2002) - For all its fame and pedestrianised shopping areas, it is probably the least suited place for a wheelchair user. It is hilly, has many cobbled areas and no dropped kerbs. Toilets for the disabled are available near the bus station but these are only suited to the ambulant because it is not possible to transfer from a wheelchair. Monchique (last visited April 2001) No disabled facilities but nice drive via Silves, view points were the trip highlights. Praia de Gale and Ponta do Castelo(last visited April 2002) - Nice views but beaches not accessible with a wheelchair. Armacao de Pera(last visited April 2002) - The town is fairly level and ramped access is available to the beach but there are no other disabled facilities. Not far away in the direction of Albufeira on the N125 is the new Algarve Shoppping Centre. A modern wheelchair friendly complex comprising shops, cafes, bowling alley and cinema. 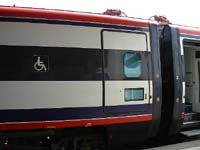 No height barriers were observed and disabled parking and wheelchair accessible toilets are available. Olhau(last visited April 2002) - An interesting port town, flat with reasonable access. There are no specific disabled facilities and few dropped kerbs but the pedestrian zone in the centre and the waterfront walk both have level flat access. Fuzeta(last visited April 2002) - Again no specific disabled facilities but a flat compact area, the town, fishing harbour and sandy beach all being in close proximity and largely unspoilt. A ferry service operates to a nearby island. With help all ferries are wheelchair accessible and for a return fair of €1.10, you can enjoy the soft white sand and the out of season solitude of its beaches. There are three steps to negotiate at the pier on the island. Here a 20 to 30 metre concrete pathway leads past a small rustic restaurant to the seaward side beach. This is journeys end for a wheelchair user but for the ambulant there are miles of beach in either direction. There is no shade but you can obtain inexpensive meals and refreshments at the accessible restaurant. This is the only public facility on the island and unfortunately its small toilet is not wheelchair accessible. Tavira(last visited April 2002) A pretty town set on a river and having plenty of character. The area is flat but has its fair share of cobbled streets. We found basic wheelchair accessible toilets in the large indoor market and in a shopping arcade by the river near the centre of the town . Villa Real(last visited April 2002) Not a lot of interest here but the centre is level, not cobbled and is a good place to shop, prices being lower than other areas of the Algarve. Monte Gordo(last visited April 2001) - No specific disabled facilities. The beach with good wheelchair access is the main attraction. To see more of Portugal, have a look at some of our photos in our Portuguese Gallery which is accessible via the top left hand side menu.